Dribble, Trap, Pass or Shoot? 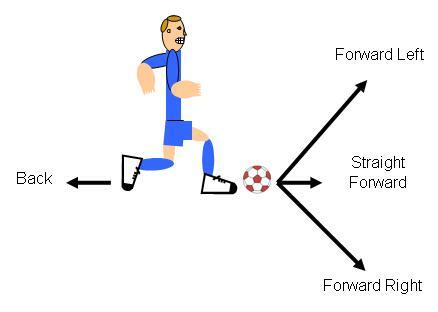 When passing, a player needs to choose between forward left, forward right, straight forward or back. 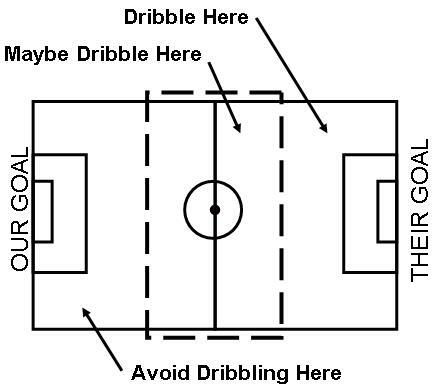 When do you dribble? You should avoid dribbling in front of your own goal. In front of your own goal you should only be thinking “clear, clear, clear!” You should consider dribbling down the sideline in the mid section of the field. You should definitely dribble in front of their goal. The decision to dribble will depend on whether you are being challenged for the ball or not. You should avoid passing in front of your own goal. Around or near your goal you should not make any risky passes. If you find the ball in front of your goal you should give it a good, hard, clearing kick and send it towards the side of the field and up field our of the “Clearing Zone” and into the midfield and shooting zones. When you are in the center zone on the sideline you should make low risk passes to move the ball up the field. 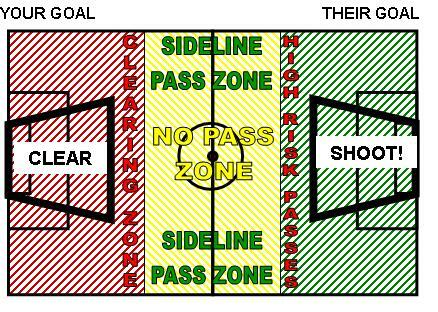 When you are in front of or near the other teams goal you should shoot or pass the ball in front of their goal.